At the Scene of the Crime: What a Trick! A while ago I started watching the Japanese TV series Trick, which dealt with impossible crimes being investigated and solved by an unlikely duo: a physics professor and a magician. The magician, Naoko Yamada, constantly gets fired and is hounded by her landlady for rent. The professor, Jiro Ueda, is a sceptic of all things supernatural, but manages to get easily puzzled over apparently-impossible feats such as mind-reading and locked-room murders. 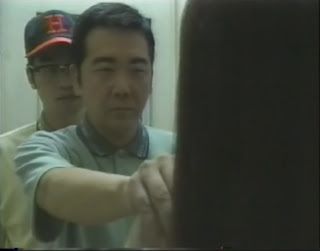 There are several other recurring characters, such as the bumbling Detective Yabe and his incompetent assistant. Big Mother, leader of "Mother's Spring"
In these episodes, Naoko and Ueda first meet, after Ueda places an ad in a newspaper offering a reward for anyone who can show him genuine psychic phenomena. Naoko manages to fool him and this launches them to investigate a cult known as “Mother’s Spring”. The leader is known as Big Mother, and she claims to have mind-reading abilities. She is also known to levitate… and nasty deaths often come to those who attempt to betray her! The mystery is interesting, in that a lot of great tricks used by fake mediums/mind readers are exposed. Some are less certain and rely more on psychology than others, but they’re interesting to see. The big problem is that the episodes leave gaping plot holes—a mysterious death in Episode I is left unexplained by the end, for instance. And although a locked-room poisoning occurs, the solution is a terrible cheat, because it relies on the locked-room not really being a locked room in the first place! A terrible let-down to an otherwise enjoyable little mystery. In these episodes, Naoko and Ueda investigate the mysterious doings of one Miracle Mitsui, who claims he can make things disappear by sending them to another world. He demonstrates his power by… making an entire village disappear! Next, he makes a police officer disappear, an ancient stone structure vanishes into thin air, and the head of Dr. Ueda goes missing, also presumably to the “other world”!!! This episode is an improvement over the last one, but it still has problems. Some of the tricks are incredibly obvious, and it’s kind of hard to keep a straight face when you find something important out. The episode also misses a glorious chance to end the fifth episode on a real kicker of a mysterious and apparently-impossible disappearance, so that the chosen ending is a bit of an anti-climax. 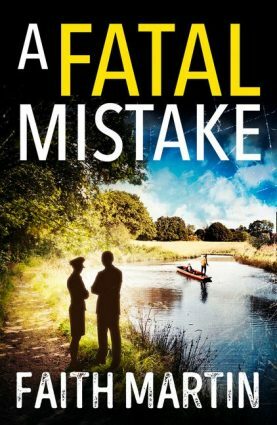 However, police officer’s disappearance is wonderful and some of the tricks performed by Mitsui are really worthwhile. And it happens! Although Naoko and Ueda keep guard over her, at 10 PM, their prisoner gets up and strangles an invisible person with an equally-invisible belt. 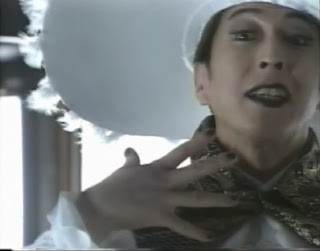 When the deadly pantomime is finished, she claims she has just killed Umeki Ryuichi. Ueda goes to look at the spot where she directs him… and sure enough, a corpse is discovered, belonging to one Umeki Ryuichi… and he was strangled at about 10 PM! 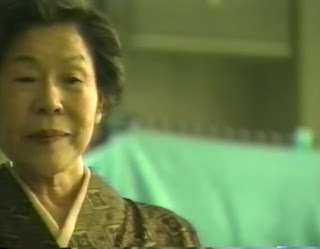 In the highlight of these episodes, a seemingly-solid case is constructed by Naoko where Kurosaka murdered Ryuichi in person, but the woman laughs it off and proceeds to savagely tear down every last shred of the case, proving it to be nonsense from start to finish. Then, she picks up an invisible knife and begins stabbing wildly at the air, only to be sprayed with blood!!! When the next victim is discovered, the blood type of the victim proves to be identical with the blood type of the blood that spattered onto Kurosaka… who was nowhere near the crime scene at the time! Unfortunately, the ending fails to live up to the promise of the first half of the two-parter. The solutions to the first two crimes are dull and uninspired—in fact, it’s one of the oldest and worst cheats in the book. The third crime should never have occurred, but did so due to the sheer incompetence of the police. And while that’d be okay if the solution to the third crime was good, the solution is a variation on one of the oldest and most boring tricks in the book. But I do like the ending of this story, despite my reservations on the solution. A short episode, this one, where Naoko exposes a fake mind-reader. Although he gives impressive demonstrations, they are exposed due to wordplay that can make sense only in Japanese. The non-Japanese viewer is left at a severe disadvantage, but there’s nothing particularly special about the solution in any case. It also has a serious limitation—the method is acceptable, but the results brought about by this method are as wildly improbable as those in the Jonathan Creek episode The Seer of the Sands. Is it good? Yes. But it’s still flawed. The last episodes are a kicker, as Naoko finally comes face-to-face with the spiritualist who killed her magician father years ago. The answer is brilliantly ironic and sets up a wonderful paradox for the series as a whole. The episode is a fun one in that several tricks are exposed—such as how to bend a steel bar through willpower—and the explanations for the most part are quite solid. I liked the concept and the execution, and the comedy is fairly good, surviving the language barrier. The only thing really missing was a kicker of a locked-room mystery puzzle, but the episodes as a whole make its absence as inconspicuous as possible… besides, when there’s buried treasure to be found, locked rooms are not vital! And that’s Trick, season one. Much of its comedy (and in at least one case, the key to the mystery) flew over my head because I’m not Japanese, but even despite the language barrier, the series made for some excellent viewing. When the comedy works in such a way that language is not an obstacle, it really works well… such as when police officers in episode 1 ask a physicist if it’s possible to trigger an earthquake on demand by having a lot of people jump up and down! But be warned: the humour might not be to everyone’s taste. I’m sure there’s a lot of cultural stuff at work here as well, but there’s a lot of sexual humour involving Ueda’s—er, God-given gift (which is apparently enormous)—and Naoko’s—er, I’m not sure how I can paddle my way around this one. You don’t actually see it, but some people might not like the mental pictures involved either way. I think that this is one of the rare cases where this kind of humour is (most of the time, at least) genuinely funny, so I didn’t mind. That being said, the mysteries often leave plot holes you could drive a dairy farm through. Yet they’re all worth watching. They expose several tricks used by fake mediums and spiritualists and some of these are highly impressive feats with simple solutions! The locked rooms and other impossibilities are not nearly as satisfying at times—in particular, the episodes dealing with the Pantomime Killer come up with some good false solutions but fail miserably with the real solution by making them hinge on the worst clichés in the genre. That’s pretty much all I can think of saying! I enjoyed season 1 of this series and I hope to be able to review the other seasons in the near future. It’s definitely enjoyable to watch! It's not an unfair comparison. The only thing is that there's a lot more focus on comedy and wordplay. Occasionally the subtitles would help point out a few instances of wordplay (especially when it was at the centre of the solution) but most of these instances flew over my head. I was SO excited to watch this series, but I gave up after the first story arc. It just made so little sense that I lost all faith in the writers. With mysteries, I think once that trust is lost a lot of enjoyment goes along with it, because at the back of your mind there's always the nagging suspicion that the solution to the mystery will be that there is no real solution, just a lot of hand-waving and nonsense. And I'm prepared to accept that the comedy gets completely lost in translation, but surely production values are production values? There were so many weird camera angles, terrible lighting choices and scenes that just ended abruptly that it seemed like a bad student production. Yes, that is the series in question! I can see why you would say that-- there were many moments where the direction absolutely bamboozled me, with the weird angles and so on. If I recall correctly, fellow blogger Ho-Ling addresses this on a post in TomCat's blog-- the Top 100 mysteries, I think it was. Anyhow, over time, I got used to it and it ended up forming part of the series' charm. But to answer your queries, I would need to call upon an expert-- I know absolutely nothing about Japan's culture, etc. Plus, I was willing to forget about the problems with plot considering all the tricks used by fake spiritualists exposed. But the series improves considerably in season 2-- for one thing, the subtitles are not so crappy (and a lot more wordplay is explained, thus making the comedy far better for ignoramuses like yours truly). But also, the production values are far higher, the weird direction choices are toned down, and there are several very atmospheric moments throughout the mysteries. Plus I can't help but feel a tinge of pride at having spotted a pretty funny reference to THE VILLAGE OF THE EIGHT GRAVES in the first episode of season 2. I have always wanted to watch this series, but all except one of the JDrama's I have watched ended in a disappointment - low production values being one of the reasons. This was one of the reason why I was unable to finish TGQ. I loved the anime, but found the JDrama unwatchable. This made me a bit standoffish. Watching Trick is a lot of fun. 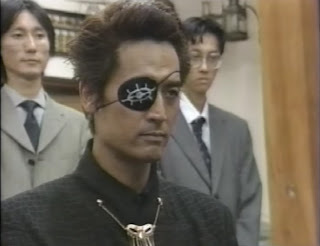 My favourite episodes from season 1 were the story about Miracle Mitsui and episode 8, but I liked them all. I think too that the solution of the pantomime killer arc was a bit disappointing, but the false solution was an interesting one (althought quite close to a mystery from the manga "Sakon the puppet master"). Season 2 is even better (in my opinion) with some great mysteries (particularily the "ghost taxi" and the "cursed forest" storylines). About the style of the series, it's not the typical way Japanese TV works, but the typical way the director of the show, Tsutsumi Yukihiko, works. You will find unusual camera angles in his other dramas, like "Keizoku" (another mystery drama with impossible crimes) or "Ikebukuro West Gate Park". 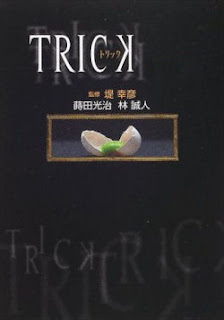 I absolutely love TRICK! The chemistry between Abe (Ueda) and Nakama(Yamada), Tsutsumi's awesome directing (weird camera angles, non-sequitur humor and scene cuts, jokes in the background, etc. ), the music (and Onitsuka Chihiro's ending songs <3), everything was just perfect. Of course, like Patrick addresses here, it's a very particular series (in general, TRICK's humour is not to be explained by Orientalist 'it's Japanese' reasons). But a lot of the humour does rely on (Japanese) pop-culture, so I can imagine it can be hard to understand at times. One should also realize that TRICK is not really meant to be 100% serious, so one should not pay too much attention to the plot-holes. I see the series more as a playground based on the detective-model that has been able to carve out a very distinct and recognizable identity among the (overflooded) market of Japanese detective dramas. I apologise for taking so long to get back to the discussion. I have two words in my defence: exam season. Nice way to think of it-- I wish I'd thought of it in such terms first, though! Incidentally, I agree 100% about the music. I even went ahead and, like an egghead, purchased the 10th Anniversary soundtrack. It is liquid epicness... though I'm not sure why precisely it would be liquid. Thanks for stopping by and I hope you'll be able to chip in when I get to Season 2! While not one of the the greatest examples of puzzle-plot detection, I think the series does a good job playing with the genre's conventions and enjoying the ride. It's a really fun series and I think you would enjoy it... though be warned that the subtitles for Season 1 can be absolutely dreadful much of the time!